Yes, apparently Skaven are my drug. I can’t get rid of them for a longer period of time, and after few weeks I’m back to painting them all over again. They are way to cool to leave them alone:). 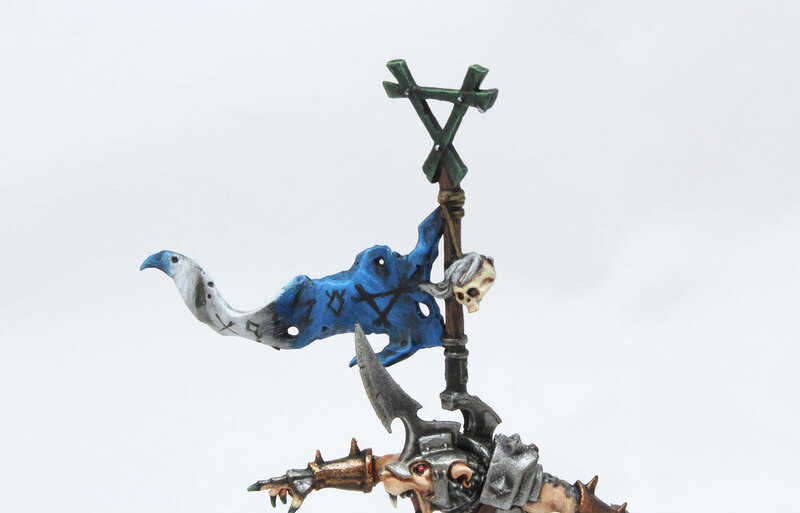 So, let me present my latest achievement – Skaven Warlord – End Times release. 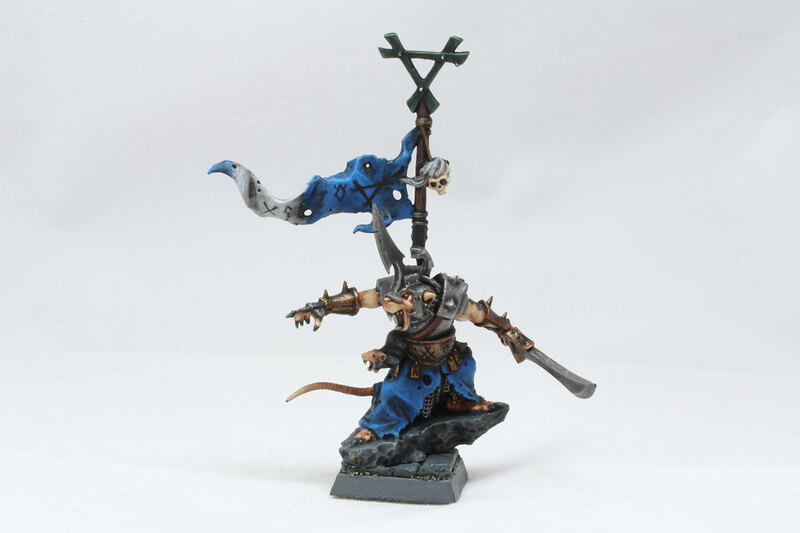 Amazing model – love the posture of that guy, love the details (tiny rat on Warlord’s belt or human head stuck to the pole), love the typical Skaven attitude. Natural born leader;). I got great bargain deal for this miniature on internet auction. I paid about 2/3 of actual GW price – so it would be a sin if I would not buy it. The timing was also perfect because I needed one more mini for my Skaven army. I needed the chief of my clan. The Clan of mine so far has no name. And they did not have the leader. All I know – they are vicious and hungry for victories all over Old World and beyond…Lustria, Arabia, everywhere! And from now they have someone to lead them to the glory and fame. The warlord arrived. My clan colours are blue/grey. 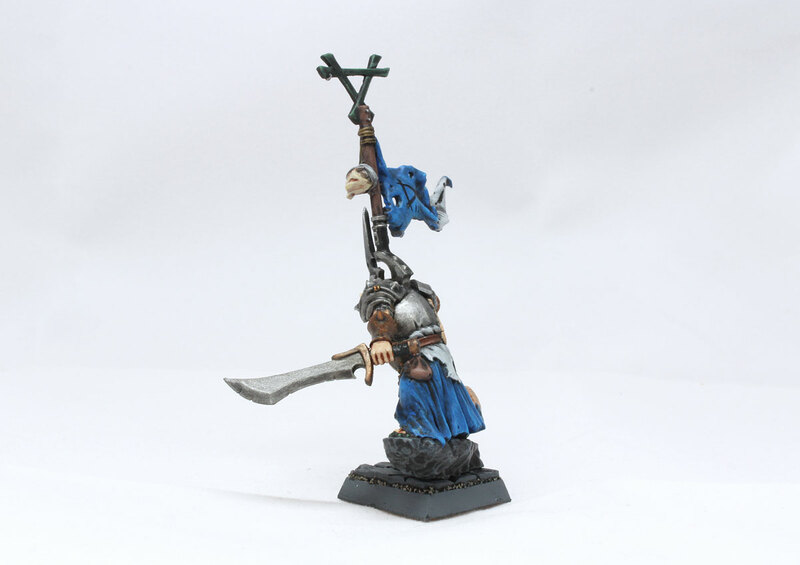 I don’t remember the origin of that idea, but what I do remember my first painted Clanrat had the rugs grey and blue. And it was mid 1990s. 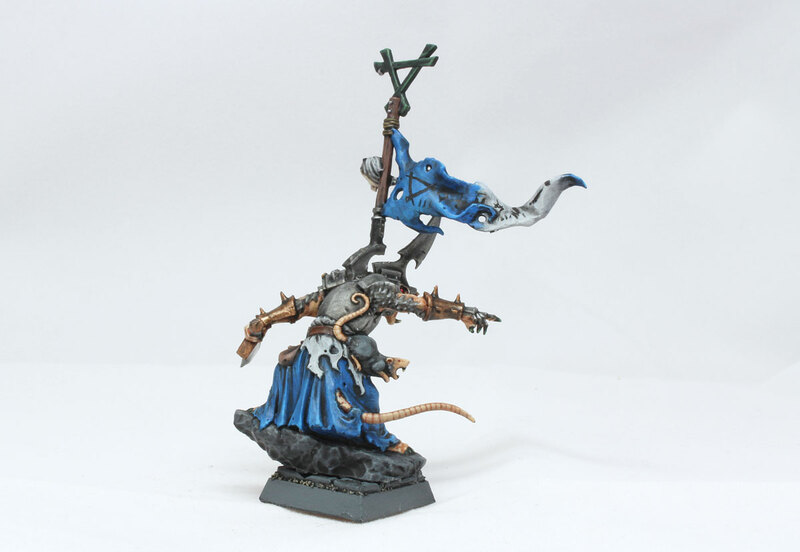 This coloristic scheme is stuck in my head for around 20 years and still this association I find the best for my Clanrats. So, it was no surprise, that their leader obviously wears the same colours. Blue and light (almost white) grey. For blue I used Caledor Sky and for grey: Administratum Grey, lightening up with the mix of grey/white. I also added dome shade with Nuln Oil to achieve some dirt/unclean effect on the miniature. 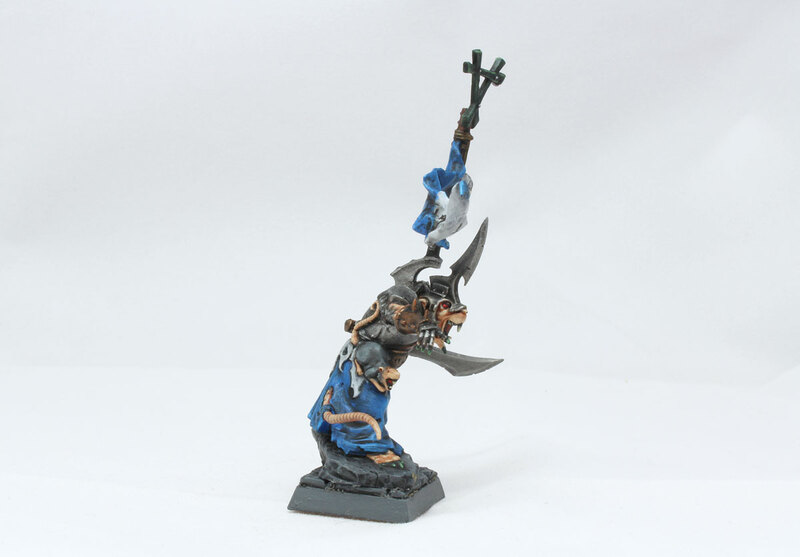 One of the differences between my Skaven heroes and common rats are their claws (toes and hands). Commoners have natural toe claws (I use Ushabti bone with Reikland Fleshshade), but elite – Warlords, Grey Seers, Warlock Engineers or Assassins – their are different. Better, I mean:). I assumed the Skaven of higher levels of the society – they use lots of Warpstone. Sometimes they overdose. So, everything in their body are just leaked with Warpstone – liquefied, powered, doesn’t matter. Their bodies are filled with Warpstone. And I figured out that their claws should be green – just emanate with green. That’s way this guy apart form other Clan members have green claws. I like the effect – they just glowing:). On the banner – I added few runes. It is my best and the lousiest free hand I can deliver at the moment (I should practice more:). The base is resin Wyrdstone Mine from Fantascape. I wrote about how I chose bases for my Skaven army in one of my previous posts. …but now all the easy part (painting this model) is done. I need to proceed to more difficult task. Inventing the name for the Warlord and for The Clan. Right now this lord in unknown – no great deeds to sing, no glorious battles won. Nothing. He will be writing his story soon. And I hope I’ll invent the name for him, for clan during one of the battles, or during writing battle reports. In fact, I’m right after the battle against Dogs of War. Battle report will be written soon, and the name undoubtedly will come to my mind as well. And all will hear about my Clan! From now to the eternity! And Monday I’ve played the battle of WHFB 8th edition against Orcs and Goblins, and my next Friday I’ll play another Herohammer game with Empire (it’s going to be follow up story of one of my July battles) – so expect lots of Warhammer battle reports. Can’t wait to write the all:). There’s something really important about having a leader in an army, I feel. You can always add more models but once the leader/general/warlord/chief/whatever is in then the army is complete. Until then it’s missing something. Nice work on your Skaven warlord, time to put the evil plan into action!